Right mouse click on the picture and select 'Save this file' or 'Save this link' to copy the PDF to your harddrive. Please feel free to use and give away these patterns, just leave the copyright symbol so that others know who the designer is. 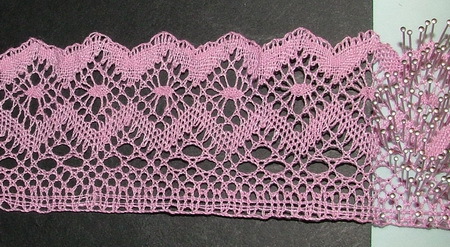 If you sell the lace you make from these patterns - fantastic! 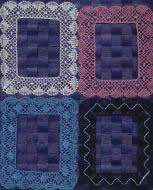 If you are using Lace2000 or Lace RXP please check out this page. 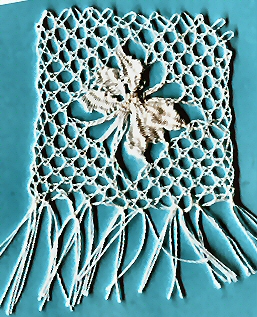 Ruth Bookmark, continuing from the leaf spider test above, here is the bookmark that uses that element. Named after my mother, Valma May Ruth Ford (nee Knight) dec.
Yvonne Medallion - named after my older sister Yvonne Cherryl Gill (nee Ford) dec. This pattern can now be purchased complete with colour coded diagram and detailed written technical notes from here. Continuing the 5x5 grid theme I have concentrated on spiders mostly in ths sampler but what do you think?